An outdoor spa is a great way to upgrade your backyard and relax! Spring is finally here and that means that the warm weather is approaching. It is time to start enjoying the weather and getting outside more. If you are looking for a great way to upgrade your backyard this spring, an outdoor spa is a great option. 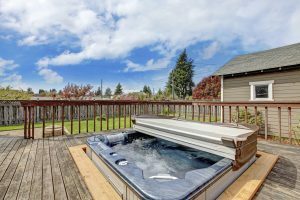 Whether you just want to unwind after a long day or wow your guests with a spa tub, an outdoor spa will surely add a “wow” factor to your home. Here are three benefits of an outdoor spa for your backyard. Everyone from children to grandparents can enjoy the warm, bubbling water of an outdoor spa. It’s a great way to bring everyone together or to just cool off after you took a dip in the colder pool water. If you have a pool, an outdoor spa is a great place for all of the adults to hang out while your children go for a swim. That way, you can ensure that the children are swimming safely while also enjoying yourself. An outdoor spa does not only have recreational benefits, it also has some health benefits, including stress relief! The warm water helps to increase circulation which leads to the production and release of endorphins, which is a hormone that contributes to feeling good. The movement of the water helps to relieve muscle tension in the neck, shoulders, lower back, thighs, and feet. A few minutes in the hot tub has been proven to relieve headaches and muscle pain caused by stress. If you sit in your outdoor spa for a little while about an hour or so before bed, it can actually help you fall asleep faster. Your body temperature increases because you are submerged in warm water. When you get out, it cools which mimics the decline in body temperature that occurs when you fall asleep. This fact combined with the relaxation that comes from the outdoor spa can help you not only fall asleep quicker, but also sleep better throughout the night. If you need the perfect spa for your home, Sunrise Pool Builders are here to help. We are happy to walk you through every step of the design process and ensure that your pool or spa meets the needs of every member of your family and all of the activities you want a pool or spa for. If you are ready to design the perfect pool or spa for your home, contact the experts at Sunrise Pools & Spas. For more information on our services, contact us online or give us a call at 410-349-3852. To see examples of our work, check us out on social media on Facebook, Twitter,LinkedIn, Pinterest, and Google+. This entry was posted on Thursday, March 29th, 2018 at 3:38 pm. Both comments and pings are currently closed.